* 8 stereo areas of sharp cut-off stereo filtering. * Adjust levels separately in all selected zones. manipulated within a full mix. * Each zone can pan separately. 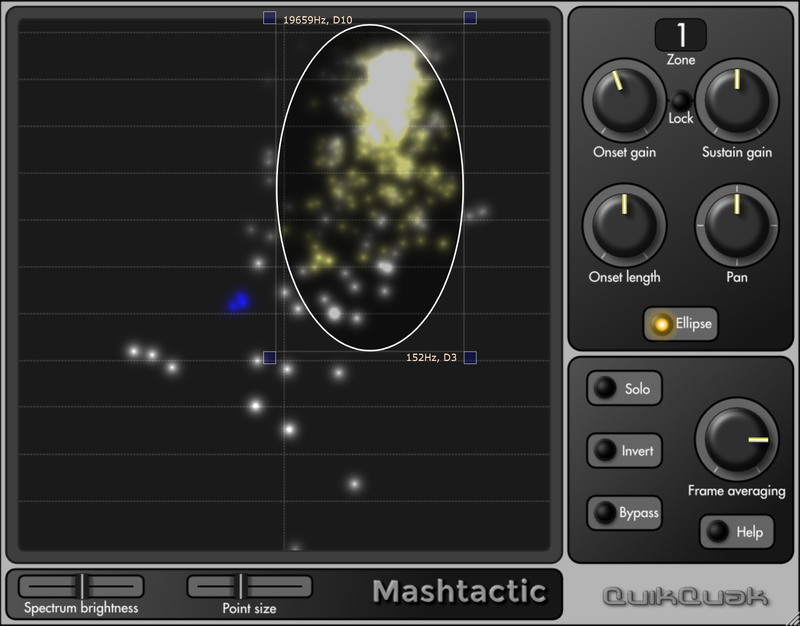 MashTactic was initially designed as a mashup tool. It can separate different parts of a full mix, manipulating different frequencies and stereo location. Up to eight zones can be created that can then be panned, emphasised or cut out completely. It can be viewed as an eight band filter that exists in stereo ranges as well as frequency. Transients of varying length can be separated from constant sounds, which allows the user to manipulate the initial punch of percussion, either by emphasising or softening the attack, this can be done separately in any of the eight zones. There are no harmonic analysers in MashTactic. It's all achieved through stereo balance analysis and very sharp filtering. Some mixes won't be pulled apart that easily. Please try the demo. All QuikQuak plug-ins and software are copyright © 2005-2011 David J Hoskins. All rights reserved. All technical specifications and prices of the products specified on this web site may be subject to change without notice. Copyright notices may not be removed or changed. QuikQuak and all QuikQuak product names are trademarks of David J Hoskins. Microsoft® and Windows® are trademarks of Microsoft Corporation. Cubase and VST are registered trademarks of Steinberg Media Technologies GmbH. Mac and Intel Mac logos are trademarks of Apple Computer, Inc. All other trademarks are the property of their respective owners.